Areas that are intended to be low maintenance fields rather than lawns can be seeded at one half the normal lawn seeding rate. The No Mow turf will take longer to develop at this lower seeding rate, but will typically fill in to form a sod within one full year. 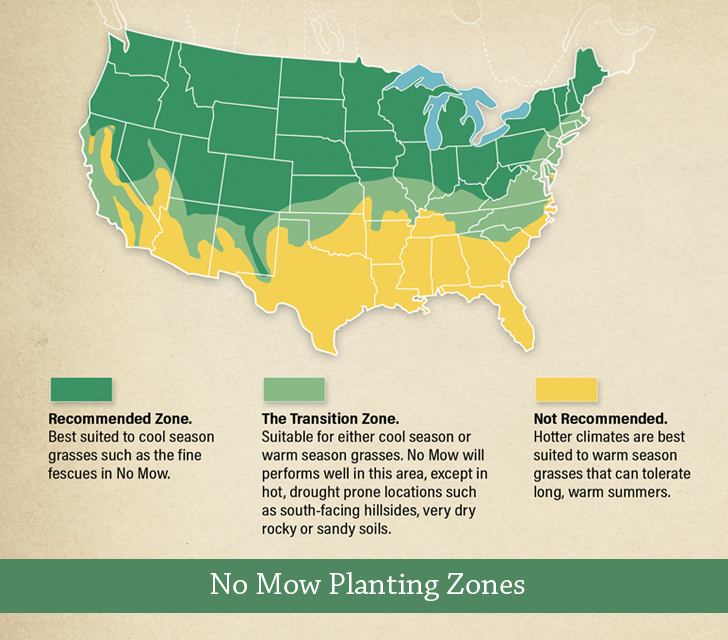 The cool-season grasses that comprise our No Mow Lawn Seed Mix are recommended for planting in northern climates of the United States and Canada (above approximately 37 degrees North Latitude). No Mow is also adapted to the coastal areas of the Pacific Northwest, the cooler mountain climates in the east-central states, and in the western mountains from the mid-elevation aspen woodlands to just below timberline. No Mow thrives in full sun to partial shade on any reasonably well-drained soil, and is particularly well suited to growing on dry, sandy or rocky soils with low Nitrogen levels. No Mow is not recommended for damp soils, or heavy clay soils with less than four inches of rich loamy topsoil. No Mow is one of the most shade tolerant turf blends available, and thrives in light to moderate shade. It does particularly well under individual trees that receive indirect light from the sides, and is an excellent choice for around surface-rooted trees that leave little available soil for turf, such as maples. It also thrives in woodlands composed of oak, hickory, elm, ash, birch, white pine, and other “open canopy” tree species that allow filtered light to reach the ground level. No Mow will even grow under spruce trees that receive light around their edges, provided that the surface layer of needles and duff are removed to expose the mineral soil prior to seeding. When planted under deciduous trees the leaves must be raked off or thoroughly chopped up with a mulching mower after autumn leaf fall to prevent smothering of the turf grasses over winter. 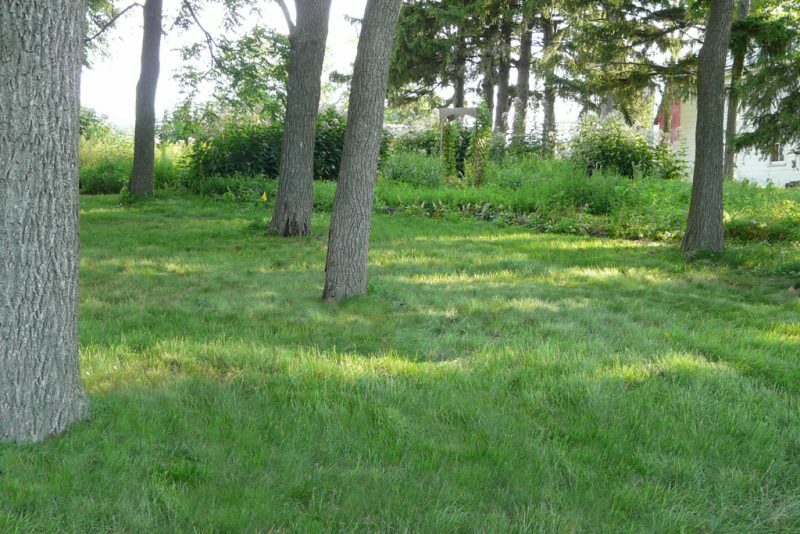 No Mow will not perform well in deep shade, as occurs under Sugar Maples and dense stands of conifers. No Mow is capable of thriving under the shade of black walnut trees. However, the leaves and nuts must be removed in fall, to prevent damage by high levels of the plant toxin produced by walnuts called Juglone. Black walnuts, like oaks and hickories, cast moderate shade at the ground level, creating ideal growing conditions for the shade-tolerant fine fescue grasses. No Mow does best in climates that receive annual precipitation of 25 inches or more, with at least half arriving during the growing season. In drier climates with less than 25 inches of rain, supplemental irrigation can be supplied during dry periods in summer. No Mow is more drought tolerant than Kentucky Bluegrass, making it an excellent alternative for cool, arid climates. No Mow will not survive extended droughts such as the current megadrought in parts of California and other western states. 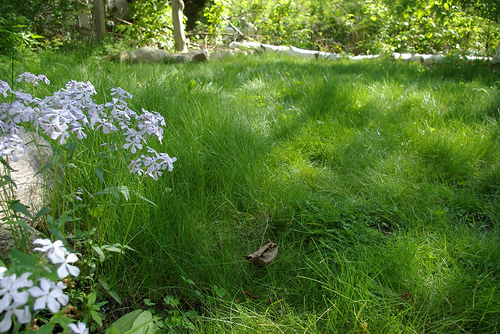 The fine fescues in the No Mow Lawn Mix grow well in soils within a pH range of between 5.0 and 8.0. The optimum pH range for these grasses is between 5.5 and 6.5, but will thrive in a wide range of soil acidity and alkalinity. No Mow is a blend of bunch-forming and Creeping fescues derived from species that are native to the Northern hemisphere. A combination of six complementary varieties of fine fescues makes our No Mow Lawn Seed Mix a versatile and adaptable blend that is an excellent choice for a wide variety of planting situations and applications. The bunch grasses are exceptionally drought resistant, thrive in low nitrogen soils, and have moderate tolerance to heavy foot traffic. The creeping fescues spread gradually by underground rhizomes to help fill in between the bunch grasses to create a weed-resistant sod. The creeping fescues also help to fill in areas that may experience turf damage. Some of the fine fescue grasses in the No Mow Lawn Mix have been documented to possess allelopathic properties, in which the grasses produce compounds that prevent or retard the growth other plants and weeds. This “natural herbicide” makes No Mow particularly resistant to invasion by other herbaceous plants that often plague other types of turf. Hard Fescue (Festuca brevipila). Two different varieties of Hard Fescue are generally used in the No Mow blend. These “bunch” grasses are among the most heat and drought tolerant of the fine fescues. They grow slowly, thus reducing or eliminating the need for regular mowing. The Hard Fescues are the most tolerant of heavy foot traffic of the fine fescues. They do not tolerate close mowing (less than 3 inches). Sheep Fescue (Festuca ovina). Another “bunch” grass, Sheep Fescue is extremely drought tolerant and can subsist on a diet of almost no Nitrogen. It is moderately wear tolerant, but will not perform well if closely mowed (less than 3 inches). Both Sheep Fescue and the Hard Fescues are slow growing and require little or no fertilization, making them ideal for low maintenance lawns. Chewings Fescue (Festuca rubra subs. fallax). This bunch grass is among the deepest green of the fine fescues and makes a very high quality turf. It is the most competitive of the fine fescues, helping to crowd out weeds. Chewings Fescue thrives in acid soils, such as those found under conifers and oaks. Although more tolerant of close mowing than the other fine fescues, it does not stand up well to heavy traffic, and is prone to developing a thatch layer. Red Fescue (Festuca rubra). This is one of the two creeping type fescues in the No Mow Lawn Mix. Similar in appearance and growth from to the “bunching” fine fescues (above), the “creepers” are also drought resistant and require little nitrogen. These “creepers” help to bind the bunch grasses together to forming a dense sod. Creeping fescues do not form a thick thatch layer. However, they are not tolerant to heavy traffic and do not respond well to close mowing. Red fescue is one of the most shade tolerant turf grasses. It also possesses a high salt tolerance that rivals Alkaligrass (Puccinellia distans, var. Fults), a turfgrass that is commonly planted in areas subject to high salt levels. Creeping Red Fescue (Festuca rubra var. rubra). Similar to Red Fescue, Creeping Red Fescue is the second creeping variety in the No Mow mix, and helps fill in damaged areas of turf. Creeping Red Fescue is the most tolerant of the fescues in the No Mow lawn mix, and can be cut at a height of two inches, as compared to four inches for most of the other fescue varieties. However, this is only once component of the No Mow lawn mix, so your fescue lawn should never be mowed lower than three to four inches. About Using No Mow with Annual Rye for Erosion Prone Sites.